There’s no doubt about it – if you have a drive-thru lane, there’s not a better investment you can make than digital signage to increase sales. 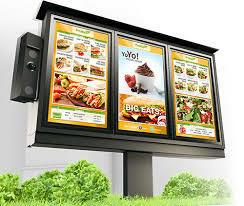 Digital menu boards are the easy way to make sure that your drive-thru customers know what the day’s specials are. And, when the menu changes with the time of the day, you can get the information out through an app on your smartphone – your staff won’t have to go outside in the freezing cold or the pouring rain to change a painted or printed sign. It will take some time for your customers and your staff to get used to the new digital signs. Let’s face it; nobody likes change at first. But, almost immediately, you’ll find yourself experimenting with new meal specials, if for no other reason than that you won’t need to go through all the hassle of a trip to the print shop with each new idea, because you’ll be making menu changes electronically. Planning is the Key. And it is made a bit more complicated because the physical layout of your drive-thru lane may well determine not only what is best, but also what is possible. You may not have enough room to take advantage of everything that’s possible with digital signage, and there may have to be tradeoffs. Presell Boards. It’s the good old 80/20 rule – 20% of your items generate 80% of your sales, so a presell board is one option you won’t want to pass up. And that’s because while you want your customers to be aware of everything you offer, a goodly portion of them will order from those few hottest choices you’ll highlight on the presell board. And, what a way to boost throughput! If Ms. customer doesn’t have to spend a minute and a half perusing your entire menu and instead chooses one of the half-dozen or so items that are featured today on the presell board, think of how much faster the line will move. Other important options include electronic order confirmation and triple screen digital signs. There are hard choices to make, and that’s the reason that, while the price is important, so is working with a vendor that you can trust.